Mainland Colleges Offer In-State Tuition To Students Affected By Hurricane Maria : NPR Ed State colleges, community colleges and one private university are working to help students in Puerto Rico and beyond continue their education. Some universities on the U.S. mainland are offering assistance to students in Puerto Rico and the Caribbean affected by Hurricane Maria. Several schools have gone as far as waiving tuition, others have offered reduced tuition by granting in-state status. Eighteen-year-old Mariela Serrano arrived in Miami to attend Florida International University a month before Hurricane Maria devastated her home in Puerto Rico. Then, FIU announced it would give students from Puerto Rico and the U.S. Virgin Islands in-state tuition, extending the offer to current students like Serrano. After the category four hurricane hit Puerto Rico, Serrano says it took weeks before she could hear her mother's voice. All the while, having to keep up with school work and exams. "I couldn't concentrate. I couldn't sleep," she says. "The only thing I could think of was my family's well being." Serrano was relieved when she finally heard from her mother, but because she hasn't had electricity or water, her business has been devastated — she's a dentist. "I have no family here," Serrano says. "I am [financially] dependent on my mother." With FIU's refund, she says she was able to send about $4,000 back home and she also began working at FIU strong, a hotline for students in the Caribbean affected by the hurricane. About 200 students have already registered for a fall semester at FIU, says Maydel Santana, a university spokesperson. Santana says the university decided to extend in-state tuition to current students, too, because of hardships at home. "It's important that these students don't stall and that they continue their education," she says. In New Orleans, the University of Tulane announced last week it would offer one free semester for Puerto Rican students as a way of "paying it forward," after Tulane's students were taken in at other schools after Hurricane Katrina. Tulane will accept applications for the spring semester until Nov. 1. After the first semester, though, tuition and fees for one academic year are around $53,000. 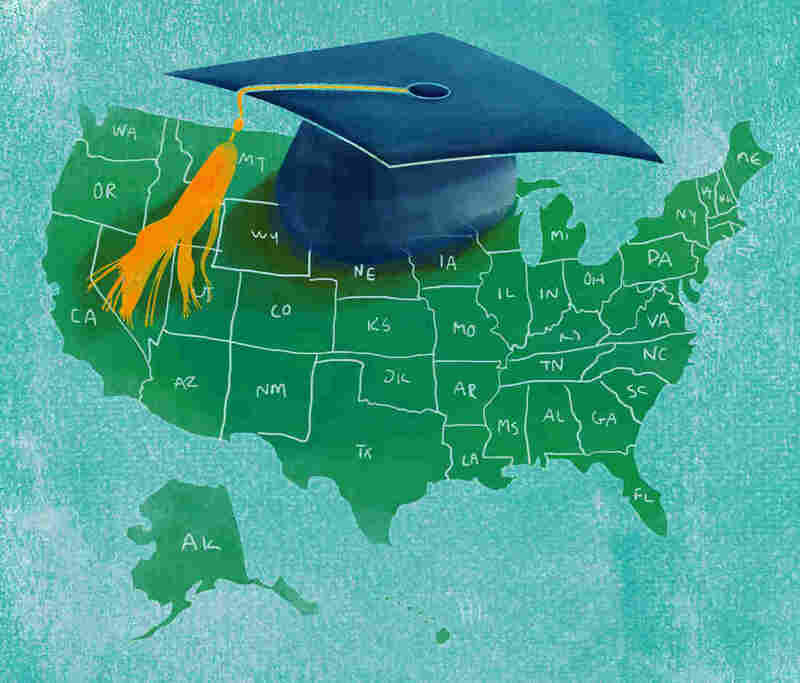 Other schools offering tuition assistance are: 64 campuses of the State University of New York, 17 Connecticut State Colleges & Universities, five state and six community colleges in Florida and also the University of Arkansas. New York Gov. Andrew Cuomo requested SUNY and City University of New York allow students from Puerto Rico and the U.S. Virgin Islands to continue their college education at the in-state tuition rate. "This action will alleviate a huge burden for these families as they try to repair and rebuild their lives," Gov. Cuomo said in a statement, adding "New York will continue to ensure the bright light of opportunity shines on everyone." SUNY announced it would follow the governor's request and CUNY board members will vote Monday on a resolution to allow those students to receive in-state tuition for the 2017-2018 academic year. Governor of Florida, Rick Scott, asked the same of his state. State colleges in Florida offering in-state tuition include the University of Florida, University of South Florida, Florida State University, University of Central Florida and Florida International University. Community Colleges in the state have also jumped on board, including: Miami Dade College, Broward College, St. Petersburg College, Valencia College and Seminole State College. Broward College in Miami and Hillsborough Community College in Tampa have also extended in-state tuition to students affected by Hurricane Harvey in Texas. Florida State University's law school has offered an exchange status for five law students from Puerto Rico. That status means the students pay tuition to their home institution rather than the visiting school. Those students will attend FSU Law school tuition free for the Fall semester. Undergraduate students from Puerto Rico can also receive in-state tuition at FSU. "FSU is providing a scholarship that will cover out-of-state tuition fees," says FSU spokesperson Susan Hansen. "This scholarship is also offered to citizens from other Caribbean countries that were severely impacted, including the Dominican Republic, St. Maarten and Barbuda." University of Florida is also giving 1,000 students access to online courses for the next two semesters at no charge, says UF spokesperson Steve Orlando. Once those semesters are completed, those students can decide to transfer to UF's campus and continue to pay UF's Online tuition. The application date to apply for UF has also been extended to Nov. 15 because much of the island still has no power, making it difficult for students to send in applications and transcripts. Miami Dade College is also delaying transcript requirements for students, says spokesperson Juan Mendieta. "The important thing is that they enroll," he says. "We're gonna continue this program for Puerto Rican students until the island is back on its feet." Students can also obtain in-state status through families, says Valencia College spokesperson Linda Beaty. She says the community college is being flexible in delayed transcripts. "It may be impossible to expect them to come up with an official transcript in a month or two," she says. Miami Dade College asks that students from Puerto Rico who were displaced by Hurricane Maria to call 305-237-8888. Florida International University has created a help line for students, 305-348-3481, and a website to help answer questions. "We're anticipating the bulk of them starting in Spring," Beaty says, talking about prospective students. "In the summer, we will be able to determine if there is an ongoing need that the college can continue to support by extending the in-state tuition offer."